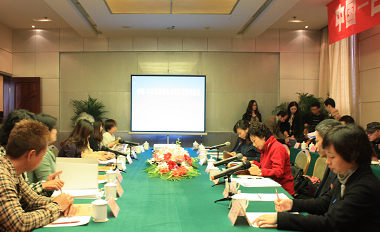 As part of Japan-China Friendship, JICE Friendship Exchange Fund was established in July 2011 for the purpose of promoting exchange among young generation, teachers, parties related to foreign affairs, in the field of culture and sports. 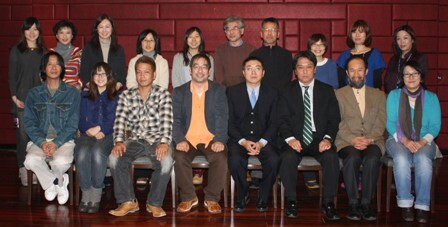 As our first project utilizing this fund, and by collaborating with China-Japan Friendship Association, we dispatched a delegation of volunteers who were involved in relief efforts in the stricken area of the Great East Japan Earthquake to Sichuan Province of the People’s Republic of China (hereinafter referred to as “China”). 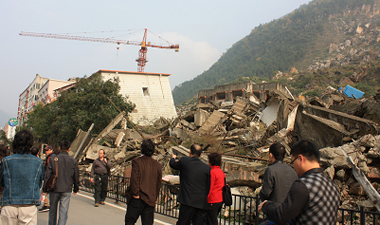 The delegation stayed in Sichuan Province from November 24th through 29th, and mixed with the local people there who also experienced a disastrous earthquake in Sichuan Province in 2008. The delegation was consisted of 13 people including Mr. Makoto Ikeda, leader of the delegation and Secretary General of Hokkaido International Exchange Center. They met with Mr. Guan Li Tong, Chief Secretary of China-Japan Friendship Association, in Beijing, and exchanged views. Also, Ms. Guo Ning, Director of China-Japan Friendship Association, Ms. Liu Meng Yan, Staff Member of Metropolitan Economic Exchange Department of China-Japan Friendship Association, Mr. Kenji Yamana, Managing Director of General Affairs Department of JICE, and Ms. Yukari Iizuka, Director of Hokkaido Office joined the group. 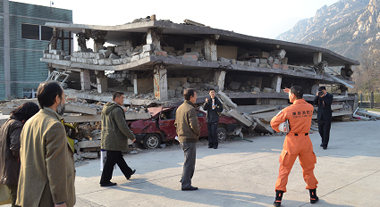 We visited the National Earthquake Emergency Rescue Training Base in Beijing. We were briefed on the general outline of the base and went on a tour inside the facility. We also had a chance to speak with Mr. Toru Nagasawa, who was dispatched from the Fire and Disaster Management Agency as part of “JICA’s Enhancement of Ability in Relief Operation Project in China”. There was a model of the remains from the earthquake inside the base, and it made us realize how difficult it was to rescue people locked inside tilted buildings. In the 3D movie theatre, we watched a 3D movie which was made for educational use, demonstrating how to prevent damages. Participants who watched the movie said it was such an informative movie that they understood the importance to educate people how to prevent damage, and that they also understood the reason why people in the base were stressing on the practical training. The delegation mixed with volunteers who were actually committed to volunteering activities in Beichuan Prefecture and Mian Yang City. Most of the volunteers from both countries are working as volunteers while doing other works for their own living. All the participants had various backgrounds; a person working as volunteer coordinators in Ishinomaki City of Miyagi Prefecture in Japan, another person involved in physical jobs such as cleaning up debris, another person providing meals and doing clean-ups at a facility for refugees, another person in Hokkaido accepting victims from the Tohoku area, and another person providing relief supplies to the stricken area, etc. They were able to find common grounds in many ways with the volunteers in China. On the last day of the visit, we held a social meeting with the people in the Sichuan Division of Communist Youth League of China. In the meeting, three volunteers from each country gave a presentation about their respective volunteering activities using the power-point, and then exchanged views. We learned that Chinese volunteers were helping with the relief efforts in places like Qinghai and Yunnan Provinces by making full use of their own experiences in Sichuan Province. One of the Chinese volunteers said that they deeply understood the situation in the stricken area of Tohoku by listening to the stories of the people actually working as volunteers on the ground, instead of listening to the news. They were all exchanging their own opinions even during lunch time. The population in Sichuan Province is about 90 million. It is famous for the cute panda, but we found out from this experience that many people were working hard from various directions to recover from the earthquake. Participants said that they came to realize the importance of the volunteering activities, and that they were more grateful than ever about the fact that they were receiving relief aid from all over the world. We are hoping that this project will somehow lead to relief efforts in the stricken areas, and at the same time, it will deepen the friendship of both nations.